This is a very interesting game for a pet lovers. Here you have to feed a little cat, who is very hungry and he wants to get his hamburger. Help him to eat it. Use tips and the cat will thank you. Have a nice time and much fun! Do you have your own pets? No? Now, this is a great chance to have it! Your main goal is to feed a little cat. 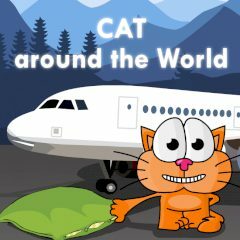 This kitty likes to travel, he wants to visit such places as Paris, Egypt, Dubai and so on. But you know, that it could be very exhausted, that is why he is really hungry and tired. You should break these blocks and a food will reach its aim, but be very careful and attentive. While breaking it, you should stay away from lightning, otherwise the food will disappear and your kitty will not get his hamburger. Be very attentive and this little cat will become your real friend. Good luck!